I wanted to get apples from the Union Square Green Market, so being in the vicinity, I decided to give Cafe Medina a try. It's honestly not anywhere I would step foot in (looks like a generic lunch counter with a long list of ho-hum sandwiches and salads), but since it's been written up by Serious Eats a couple times, I figured it was worth a shot. 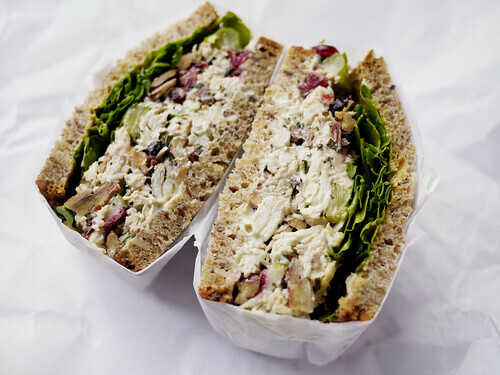 I did not find (the list was too long) the lemon pecan chicken salad, so I went for its sibling the tarragon chicken salad sandwich. I have to admit, it's a decent sandwich. All the ingredients were fresh and well proportioned. While it didn't put a smile on my face, I felt quite satisfied, and I can't complain about that. They have some Moroccan eats in the back, I may have to check that out next time.